Antone Minthorn, Democratic candidate for Oregon State Senate District 29, will be at our campaign office on Friday, October 19, from 5 pm to 6 pm. Please come by the office at 1304 Adams Avenue to meet with Antone and support his bid for the Oregon State Senate! You can learn more about Antone and his candidacy on his web page (www.antoneminthornforstatesenate.com) and his Facebook page (www.facebook.com/pages/Antone-Minthorn-For-State-Senate/286476844787026). With the presidential election going around its final turn I'd thought I'd turn my attention to the Oregon election. We have some pretty important state initiatives/ballot measures to ponder. The measures range from marijuana to taxes to gambling. The DPO has recommended the following yes and no votes. Measures 77, 78, and 85 have the endorsement of the state wide leadership. That is a yes vote on giving the governor and the legislature additional authorities in case of disaster (77), a clean up of the language/grammar in the Oregon Constitution (78), and devoting the corporate kicker refunds to K-12 education (85). The leadership opposes a constitutional amendment to prohibit real estate transfer taxes (79), casinos (82 and 83), and the phasing out of estate/inheritance taxes (84). On the measures about marijuana and prohibiting commercial non-tribal gill netting there were no recommendations. There was no consensus on these two measures thus no recommendations. Today's Oregonian had an editorial recommending a no vote on all three tax measures (79, 84 and 85) which did make sense to me. Essentially the tax structure in the state needs a review and overhaul and it should be left to the governor and legislature to to that. This would leave everything on the table for negotiations and compromise. There were two articles in this morning's Oregonian I found interesting. The first was the above editorial on taxes the other was an article about agriculture and Columbia River water. We in Union County don't use Columbia River water except for electrical power (somewhat) but the Columbia Basin is in our state legislative district and our state senate district. So the article isn't a moot point for us. Go to www.oregonlive.com to get the article. The next debate is centered around foreign affairs. Mitt Romney made a major foreign affairs policy speech which his followers hailed as a new beginning. The truth is the Republican Party split over his speech. Despite much wailing and gnashing of teeth he echoed and confirmed much of what the President has been doing. The Republican crazies in Congress however held hearings yesterday (while Congress is on vacation) that outed or advertised the activities of the CIA in Libya. The building where the American ambassador was killed was a CIA station. No one knew that until the Congressional hearings yesterday spilled the beans. A great article from the economist about Gov. Romney's foreign policy speech can be found at www.economist.com/blog/lexington . It will give you some perspective for that debate. I went to the Washington Post this moring and found a couple of articles you might be interested in. The first one was written by the U.S. economics editor for The Economist magazine. The Economist is a very respected news source. I read it weekly. The article by Greg Ip shows how little a president's economic policies influences his own term or reelection but can be felt in the next four to eight years or beyond. The next article is a response from Jim Leherer about his role in the Denver debate. I happen to be a fan of his and I have his book titled Tension City if anyone wants to read it. I will leave it at the Democratic Party's office downtown if you are interested. Go to www.washingtonpost.com for the two articles. There are two articles in the Oregonian newspaper from 10/5/12 that focus on issues in our state. The first one reported on the state Supreme Court ruling concerning campaign finance limits. In Oregon there is no dollar limitations on what a candidate can spend. The article also brought the issue into the race for Secretary of State between Kate Brown and Knute Buehler. The second article I found this morning was a guest editorial that showed no relationship between tax rates and in particular capital gains rates and the Oregon economy nor people leaving the state because of capital gains. You can find the articles by going to: www.oregonlive.com . Also, don't forget about our candidate running for state offices. Antone Minthorn is running for the state senate from our senate district and Heidi Van Schoenhoven is the Democratic candidate from our legislative district. 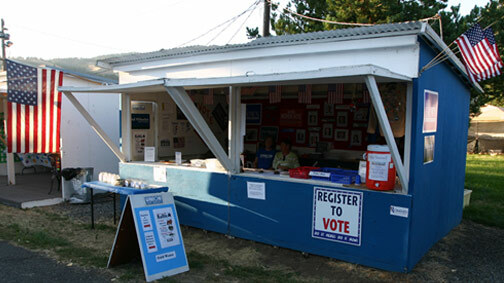 The Union County Democrats continued community outreach efforts in 2012. 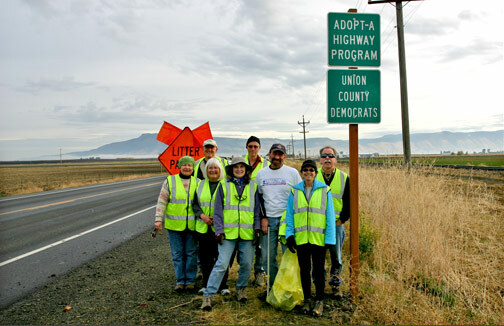 Some of our activities were the booth at the 2012 Union County Fair, participation in Celebrate La Grande and picking up litter on a section of Highway 82 between mile point 4.7 to 7.2. You can volunteer to help with these and our 2012 Get Out The Vote efforts by stopping by the campaign office at 1304 Adams Ave. (previous Marie Josephine shop). The office is open Monday through Friday 12 noon to 6PM and Saturday 10AM to 12 noon until the election. Rep. Greg Walden is holding a town hall on Friday March 23, at 3:45 pm. It was originally planned for the Stampede Hall, but I understand the venue has been changed to the Elgin High school multi-purpose room. This town hall is unusual for Walden for two reasons. First, there was advance notice that actually appeared in the Observer on Tuesday. Second, it is taking place in a public venue at a time when at least some constituents might be able to attend! I have no doubt his new found desire to hold open town halls is a direct result of the successful “Where’s Walden?” action some of us held back in December. Perhaps the congressman is feeling a bit of heat in this election year? We all understand that Mr. Walden is a conservative Republican. But voting against veterans’ benefits? Against extending unemployment benefits? Against injury compensation for 9/11 first responders? Against equal pay? Many families in Union County are hurting this winter. Cold weather and unemployment from the on-going recession have often led to heartbreaking choices between buying food or vital medications or paying for a home heating emergency. All Walk for Warmth proceeds go to assist families in Union County. Walk for Warmth calls each of us to open our hearts and wallets to help families, friends, and neighbors through a difficult time. Please join with other Union County Democrats to help and "Move Your Feet to Give Others Heat"! For more information, to become involved, or to make a donation, please contact: sherry.mendoza7@gmail.com or by phone at 541-805-8823.